Wrap up warm with this beautifully handcrafted Glenross 100% Irish Merino Wool Ladies Aran Waterfall Sweater by Ireland's Eye. With a stylish waterfall design and Aran stitch pattern, this sweater is a timeless piece from the Glenross range. This sweater is available in a selection of colors and sizes which makes the perfect addition to any wardrobe. When Ireland's Eye Knitwear started out, it was very much a family business - and that's even more true today. Over the course of the past 40 years, this native Dublin family has worked tirelessly to develop the company into a leading international brand - aided and abetted by a talented and committed workforce many of whom have been with the company in excess of 20 years. The tradition of Irish knitwear is built around individual knitters and small cottage industries, something the family have always tried to stay very close to over the years. This is something that can be seen in the hand-finishing of every single piece they produce. Ireland's Eye aim to combine a classic Irish knitwear look with the best of modern design. 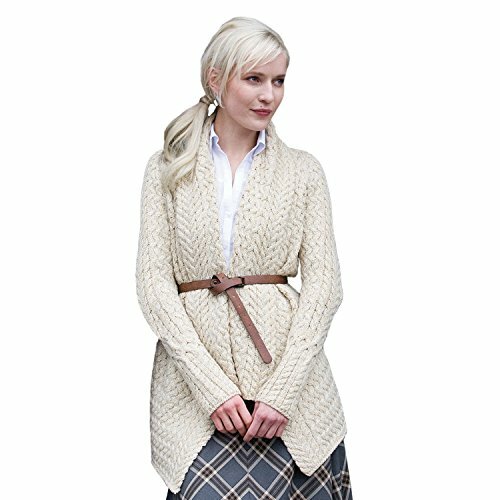 Wrap up warm with this beautifully handcrafted Glenross 100% Irish Merino Wool Ladies Aran Waterfall Sweater. Made by the renowned Ireland's Eye, Ireland's Eye knitwear is a family focused business who are based in Dublin, Ireland and has worked tirelessly to develop the company. This beautiful hand-made sweater features a stylish waterfall design and Aran stitch pattern, this sweater is a timeless piece from the Glenross range. This sweater comes in a selection of different colors and sizes, which makes the perfect addition to any wardrobe.